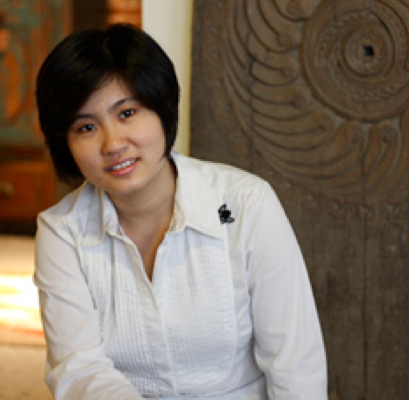 Interior designer Aileen Martinia is 35 and comes from Indonesia. She’s been in the Netherlands for 14 years and dreams of retiring to a beach on Bali. Young, innocent love. In the end, the relationship did not work, but I love it so much living here, I stayed. A bit of everything; it is all about the adventures, is it not? Until I retire, maybe? Then hopefully I can hang out on the beach in Bali. When I decided to became a freelancer I was forced to speak Dutch while meeting a lot of different people. My learning curve went through the roof. Currently I am able to understand about 80% of what people are talking about and reply accordingly. Pancakes. They are great ‘fast food’ when you have little time to cook for dinner. You can also eat them the next day for breakfast, and lunch. How handy is that? My family, the food and the sun. I swear like a true Amsterdammer when others are slow on the bike lane, hahahaha. In Amsterdam and surrounding area it would be Twiske Park. It’s lovely in all seasons and a great place for BBQs in the summer. Outside Amsterdam: then the underestimated camping experience that is loved so much by the Dutch. One of my favourite camp sites is het Waldhoorn in Eefde, in the east of the Netherlands. It is so liberating being surrounded by so much green. The landscape is soooo flat, and the fact that one can get used to it. I remember being really shocked looking at Belgian hills as it was my first time looking at a mountain ever. Previously I never really appreciated the many hills and mountains in my home country, Indonesia. I’d take my bike and enjoy one last biking trip in the city while munching on a Hema hotdog.